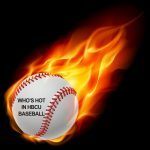 Knocking off a ranked team plus a career high outing and a pitching gem highlight this past weekend’s action as Black College Nines (BCN) continues its season long coverage of Who’s Hot In HBCU Baseball. For the first time in school history, the Jaguars defeated crosstown rival, the nations No. 8th ranked team, LSU at home in what the NCAA called the “Upset of the Day,” in this past mid-week’s action by the score of 7-2. Southern was impressive on the mound and at the plate in the win over the Tigers at Lee-Hines Field. With Southern pulling off the upset win over LSU, Eli Finney pitched 7 innings (giving up no hits through six innings), allowed only one earned run and one hit while striking out seven. Finney drew a standing ovation from the home crowd when he exited the game in the seventh inning. In its three-game series opener with MEAC North Division leader Coppin State, Delaware State produced 12 hits leading the Hornets to a 10-0 victory over the Eagles. Garrett Lawson tossed a two-hit shutout, while striking out a career-high 14. Lawson recorded eight of his first nine outs by strikeout and struck out the side in the first, third and sixth innings. He only allowed singles in the second and fifth innings and just two Coppin State batters reached second base in the contest. The Hornets won two of its three games against American Midwest Conference foe Park University winning the tie-breaker by a final score of 5-4 in a 10 innings affair this past weekend. Starting pitcher Dajuan Griffin allowed six hits and four earned runs while striking out seven in 9.0 innings on the mound to pick up the win.